This combination of doughnut patterned socks and a printed ceramic mug make the perfect gift for those who like to get cosy and warm and enjoy a treat. The socks are made from 65% cotton, 30% polyester and 5% spandex, providing a fresh, cosy feel. 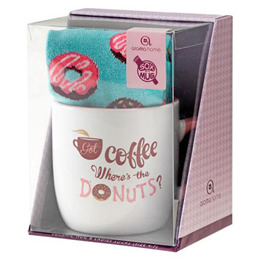 The printed ceramic mug with the `got coffee, where`s the donuts?` slogan is both microwave and dishwasher safe. Below are reviews of Aroma Home Sox in a Mug - Coffee & Doughnuts - Mug & Socks Set by bodykind customers. If you have tried this product we'd love to hear what you think so please leave a review.